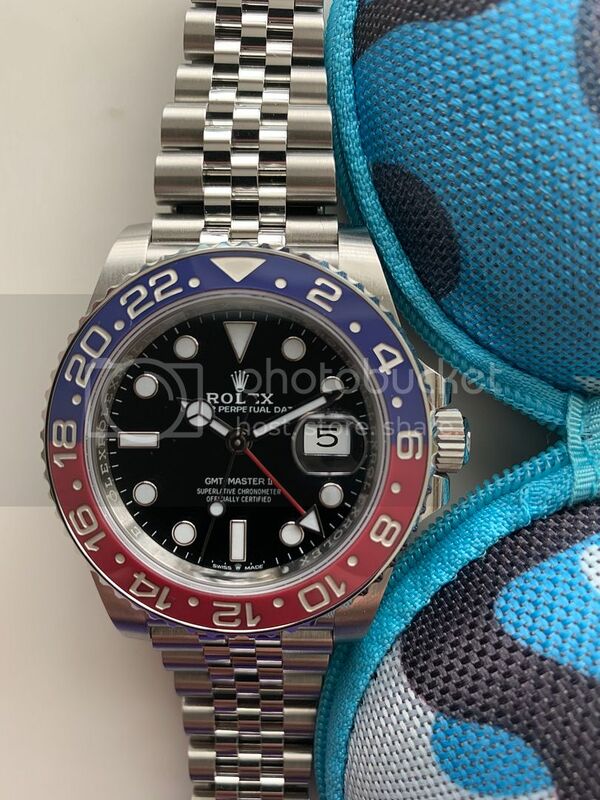 TimeZone : Rolex - Modern » GMT II Pepsi on Jubilee - What happened ? I have never been a fan of the Jubilee bracelet on a sports watch. Yesterday I was walking past my AD when he saw me and beckoned me into the store. He enticed me in with the offer of an espresso and something for me to see. How could I refuse ? ... You know I could not. We sat, We chatted and then he said he needed to show me something. He wandered off to the back office (Presumably the safe). A few moments later he returned with a tray with a watch on it but it was covered by a very smart Rolex cleaning cloth. He was smiling .... Thats never a good sign for my bank balance ! He slowly, very slowly drew the cloth back revealing a Jubilee bracelet. I said earlier I am not a fan of the Jubilee bracelet. I thought .... No, It can not be the new 126710 BLNR. It wasn't ! Eventually he revealed the watch and it was the GMT II 126710 BLRO. Air first I pulled my nose up at it. Jubilee on Sports watch ... NO. But I tried it on regardless, just to show him I was appreciative of him calling me in. He then told me the price. I could not believe it. He is an official Rolex AD and he was offering this watch NOT at list price. He was offering it at a substantial discount off list price. He did not have to stick to list price, as Rolex always insist, because it was pre-owned ... It was bought from him 2 days previously but the purchaser's husband, who she bought it for, did not like it at all. She returned the watch and that is what led me to suddenly think ... Hmmmm I think I need another watch urgently. Ten mins later, the watch had been sized for me ... I needed an extra link which he had in stock (No charge). I started this post by saying I didn't like the Jubilee on a sports watch. How wrong I was ..... I do like it (nothing to do with the price) and it certainly wears comfortably on the wrist. So I have added a GMT II to my meagre Rolex collection. I am happy ... And at this very moment, whilst I am typing this post, it is on my left wrist. So much for my resisting Jubilee bracelets ! ...in all the years I've known you that you've been reluctant to post a picture! Congratulations on a great acquisition! I think that it is interesting that Rolex is only making SS GMT's with the jubilee bracelet. The oyster bracelet SS GMT's have been discontinued. I was like you in regards to a jubilee on a sports watch, and I still favor the oyster, but the jubilee is the "new normal". Enjoy it in good health. Nice find, Charles. Congrats on the 126710. Sounds fantastic. Fyi, there is precedent regarding the GMT Master and the jubilee. A few years ago, I purchased a 1972-era ref. 1675 GMT Master. It was factory fitted with a 6251 jubilee bracelet. I am told that 'back in the day' prospective GMT buyers could choose between the jubilee bracelet and the 7836 Oyster bracelet. Enjoy your new incoming. Would love to see some pics! Regards, -Rick. Me ?? Hide ???? No Never !!!!! The first person not to mark up a "used" stainless rolex!! The jubilee bracelet is quite nice on that watch. And a discount, no less. Great pick up, I have been waiting since last March as have 2 of my friends. What a great story! I'm not a fan of the Jubilee bracelet either. I've never owned a Rolex on anything other than an Oyster bracelet (or an Oyster Quartz bracelet). However, I asked to get on my AD's wait list for the new Pepsi GMT. I figure I can make an exception this one time. Congrats again on your new GMT and Jubilee bracelet! This is exactly how I got my BLNR, same scenario, and I got it at a discount as well! Unheard of nowadays. Thats a lot better resized. In case you, or anyone else, is wondering what the blue thing is on the side of my watch it is a sort of case. I have a few watches in my collection and I keep them at the local bank. I can not store them in the boxes so I buy from a well known "Bay" website. they are actually for Earbuds. The cost only a few cents each and come from China. As they are made in a lot of colours I photo my watches alongside the case colour that is used for the watch. That way its simple and fast to select the watch I want to find wen I go to swap over. The cases are had shelled with soft interior and hold anything from a 38mm to a 42mm watch perfectly. I like your idea of taking a photo next to the case to ID the watch. That's clever. I have those old (no longer made) Oakley watch cases. They're all black. Like you, I keep my collection in the bank in these Oakley cases but since they're all the same colour, I have to open them to find the watch I want. Congrats on finding this beauty and at a less then list cost makes it even sweeter, enjoy! Congrats, Charles. It is a really neat watch, but I think I like the story about how you got it even more! Wear and enjoy it in good health. Good to see you back on the Rolex forum Charles, its always a pleasure. A gmt pepsi less than list price is impossible to get - you must be having a very good relationship with your AD ! Previous Topic: The age-old question: to polish or not?